Some call it a roller coaster. Others refer to it as a yo-yo. On the wagon, off the wagon. Whatever the metaphor, weight loss can be an up and down, in and out, and all around experience. Here’s the catch. It doesn’t have to be so hard. Even if the struggle is decades old, there is another way, a different path, a new and sustainable outcome. Imagine being more peaceful and losing weight at the same time. What would this look like? What would the metaphor become? I’m going with peaceful ocean waves moving in and out of the shore. I believe that we can make our experience less extreme if we truly want this to be so. When we apply our effort in the right direction, magic happens. So, let’s begin with food. This is usually the first thing we go after when we’re trying to take weight off. It’s also where we think we have the most control. But really, this is where the extreme states happen because we aren’t approaching food in a relaxed way. It’s intense. It’s baggage. It’s manic, frustrating, habitual, and confusing. So, imagine focusing your effort and attention away from food and set a new “weight loss goal” of practicing daily, or as much as possible. We are now putting our energy towards yoga. 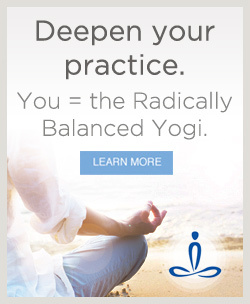 But not just any yoga. Your “weight loss” practice should leave you feeling calmer and more energized. Got that? This might be a 15 or 30 minute breathing and moving practice on the mat or a 20 minute yoga nidra in bed…I’ve seen all sorts of practices tone the parasympathetic nervous system (the rest, digest, and heal part) which is what we want. This will lessen anxiety and tell our fight-or-flight part of the nervous system to chill out. We arrive in this state more of the time. Our clothes might not fit differently at first and the number on the scale (if you even decide you want to use one!) may not shift, but we feel better already. If this resonates with you, try it. Forget about food for a minute. Practice daily and ask yourself if you are calmer and more energized afterwards. If the answer is no, tweak your practice, or find us to help you refine. And if this eludes you completely, join our 9 month course to help and prioritize how to stabilize rather than continue with extremes. If the answer is yes, ask yourself what one food thing you want to do today until you practice again tomorrow, and the next, and the next. Like (calm) ocean waves. It’s Not What The Scale Says, It’s How You Look. A Peaceful Weight Loss Perspective. Beauty is in the eye of the beholder and that beholder is us. Often what we really deeply want is to look better. Not for others, but for ourselves. We are the ones that look in the mirror and say “I look great” or “not so much”. The funny thing is that it’s not what we see that really determines our judgement of ourselves. It’s how we feel. When we are strong, have eaten well, and put on our favorite clothes—we look better. The scale number does not matter at that moment. So don’t step on it! It’s that mental state that allows us to move forward toward our goals of peace and ideal weight. Now I know that this isn’t everyone’s experience, but it’s my experience and enough of my client’s experience, that I thought I’d share with the rest of you. So what do we need to do to have more days of positive self judgement? Put extra effort into eating meals that you love AND that seem satisfying and healthy to YOU. Shop for ingredients you love and cook or assemble your perfect meal more often. Wear clothes that you love. I know this is a tall order but find something that you like (comfort is key) and buy multiples if you need to. Help yourself love yourself. Weight Loss and The Frustration Mind: What’s The Point? How often do we hear ourselves saying this. We get on that scale, or put on that old pair of pants and things are not better. We get frustrated, angry, sad, despondent or all of the above. Maybe we quit? Give up? What’s the point? This last question is the only one that matters. What is the point? Are we trying to lose 30 pounds this week? Are we trying to eat as little as possible? What are we really trying to do here? It’s important to regroup when we get frustrated. Numbers on the scale don’t always mean that we’re doing something wrong. Peaceful Weight Loss is the ongoing process of eating and LIVING in a way that brings us more mental contentment; shifting our body in beneficial ways. We get frustrated when we are not losing weight even when we are not actually at a point where we are making changes that would facilitate weight loss. It’s important to recognize this and shift into a mental space where we are calm, centered, and most importantly clear. This clarity often comes from practice. Asana with breath, yoga nidra, breathing, meditation. These practices are designed to shift us into a state that is more balanced. We can then ask ourselves “what is the point today?” What do we need to do this day that will bring us more peace and put us on a path to being less heavy? If you are in our 9 month course then the answer will be to work on this month’s coursework. If you are dieting then find useful, pleasant ways to be on that diet. Let’s not let our frustration mind derail us from the contentment and joy that is available right now as we read this. Take a breath and find your practice. I thought I’d write a little about genetics this month. It’s been on my mind lately since I recently realized that 1) I’m not getting younger and 2) I might not be from the best genetic stock (in terms of having a flat belly anyway). There’s been a lot of science around this subject, but really it boils down to this: Your genetics influence your weight – but do not dictate your future. Genetics is not a static concept. Our genes do not exist in a vacuum blindly dictating our pant size. Genes express themselves differently depending on the input they get. So our diet, lifestyle, stress levels, thoughts, etc… all influence our genes and what they chose to do. That said, some of us are able to store fat more easily. This might be a good thing if we are in a famine. But for most of us it doesn’t work out to our benefit. This is why our friend eats crap all day, never exercises, and never gains weight. They won the genetic lottery for the overabundant food society. So where does this leave us? Should we just throw in the towel and curse the genetic gods? We could, but since we’ve already done that we know it wont help our situation. What we can do is practice the most fundamental concept in Yoga – Ishvara Pranidhana – the practice of surrender. Or as I like to think of it – acceptance. Now what does this look like? First, it means being ok with the genetic deck we’ve been dealt. There is always something that we can point to that is positive to remind us that our genes aren’t all bad. Maybe you can see? Or have great hair, pretty eyes, or really good blood pressure. There are so many ways the body performs well. Next, we can accept our situation and practice in a way that is good for us and our genetic makeup. Maybe it’s really important to actively relax every day, or to get our heart rate up, or to take long walks, or to meditate in the morning. What is it that puts your entire system at ease? We can also eat in the way that truly suits our own needs. A diet that promotes health and well-being at all levels. Timing our meals so we feel great and eating an amount that brings us more energy. Finally, accepting that our body might not be our friend’s body and deeply understanding that health and happiness trump being skinny every time. May we all find peace, joy, and acceptance within ourselves. This month I’ve been contemplating what it truly means to change your thinking around losing weight. Most big changes require huge shifts in how we think about a problem. In this case, one might think that we have to think very differently around food. Maybe putting our mental foot down and saying no more to fattening foods. Maybe sticking to our diet no matter what. Maybe we need to exercise a lot more – or stop going out for dinner. Maybe it’s all of these things and more? Pretty overwhelming. But what if the huge shift is how we think about the problem itself? What if it’s possible to move through the world in a way where this ever looming issue isn’t at the forefront of our mind? What if the huge shift is more of a realization – the realization that we don’t have this massive, insurmountable issue? What if we wake up tomorrow with the knowledge that we, ourselves, or anyone else for that matter, have every resource needed to change our relationship with food and have our bodies be in a healthy state? We have this possibility. By grounding ourselves in the present, we open ourselves up to this realization. That’s why we practice. We practice to slowly but surely realize that it will be ok. Each day that we practice our minds shift and our possibly lifelong, torturous relationship with food and body shifts with it. Each practice is a step towards a radical mind shift. Can you image that? Can we allow this? Of course we can. We are not a problem. This is the radical shift: we are the solution. A little mind food for you this month. May we all experience our freedom today. Thinking about what to eat all of the time is a constant grind. Ugh! Many of us want out. If we didn’t have to deal with the food thing life would seemingly be easier. Trying to lose weight makes this matter even worse. It often feels like a small misstep or two can derail the entire process and and all of our hard work is lost. This perception is both true and false all at the same time. On one hand, if this is our experience we must acknowledge it. It’s not good to pretend that the challenges around food don’t exist. On the other hand, we have many stories we tell ourselves about our bodies, food and weight loss. When our thinking is present centered we simply say, “what’s for lunch?” and when we are stuck in our storyline we say, “I have to eat well for lunch”, or “I need to figure out what to eat that’s healthy, even though I want something else”, or “I can never just eat what I want”. If this sounds familiar, I humbly suggest finding a practice that allows you to stay more present in your thinking. Whether it’s doing yoga in the morning, finding some calming breaths several times a day, walking your dog after work or all of these things. It is important that we find practices that allow us to not get caught up in stories that ruin our experience. By staying present we see what is right before us with our relationship to food and simply act from that place, rather than the big stories of what has been or what is yet to be. Everyone wants to change – to transform – to have things different than they are. It’s human nature to desire life to be better. For many of us this includes losing weight. We often attach our happiness with health and physical beauty to this one change of weight loss. Of course this is a bit misguided. There are many things that we can shift to become and feel healthier, happier, and better looking. We can reduce our stress levels, get outside more, get a spa treatment or an updated haircut (not that I know much about this one!) to achieve much of what we are looking for. Weight loss itself requires some focus because it’s a longish process. Longish as in more than a week. It certainly does not provide instant gratification. It is often a good idea to find at least some of the other things you desire first and not think that losing weight will make all these other things magically appear. That said, I always ask my clients this one question: Is this your time? If it is – do it! If it is your time for weight loss, the thought of shifting your diet won’t be overwhelming. Most likely because you’ve found your groove in other ways and you have created the space to do the weight loss dance. If it’s not your time, that’s fine too. Knowing this will help you do other things that bring you happiness. Practice yoga, go outside, do whatever is right for you, and watch your life feel just a bit better each day, every week. Is this your time? Food for thought. May we open to transformation today. How many times have we said this to ourselves? Our diet always ends and things don’t work out. We then repeat the cycle of “If I could just” statements. I teach yoga class a couple times a week. People come to class really regularly. I mean really really regularly. Way more regularly than most of us stick to diets. Why is this the case? It takes a lot to get to yoga class in the morning twice a week. There are so many things can derail us. The reason is that it feels good. My students are committed to feeling good. So maybe all of these diets aren’t doing that. Or maybe we simply don’t take a minute to notice how they’re making us feel. Is this diet’s way of eating working for me? Is the diet making me feel good? There really is no benefit to a diet if it isn’t serving you well. There’s no way you will come to class week after week if you don’t feel better from it. There’s no way you will keep saying no to bread and butter and cappuccino cheesecake if there isn’t some real benefit, right? If you’re not feeling better, why do it? So when we’re shifting our way of eating, it’s important that we ask ourselves, “Is this making me feel better?” I mean, a lot better. When the answer is a definitive yes, then we will have less problem staying with it. And this way of eating may even become more and more peaceful. May we all live in a way that fills us with light. I thought I would write about beauty this month. Because we are all vein. I’m not judging. I believe it’s part of the human condition to want to look our best. Our weight is often part of this. We are driven to be an ideal weight as part of our desire to be as beautiful as possible. Sure, there are other reasons to lose weight. Most of which revolve around health. But it’s a rare person who doesn’t care what they look like. Our perception of ourselves is often tied to the scale. The funny thing is, most people aren’t attracted to someone based on their weight alone. So many factors play into attractiveness. Posture, confidence, personality, etc. all matter. But what really seems to make a difference is energy. Or more specifically, the quality of our presence. So many people I’ve worked with have had this realization. They find that after “cleaning up their act” – which involves doing yoga and meditation – cleaning up their diet so it benefits them and no longer suppresses their energy – they feel more attractive. And other people find them more attractive. EVEN IF THEY HAVE LOST LITTLE OR NO WEIGHT! I’m not arguing that you shouldn’t lose weight. I’m simply pointing out that if you want to be more beautiful, practice will help you. If your goals include being more healthy, losing weight, and being more beautiful they might all require the same actions of practice. Moving and breathing, developing presence, and eating in a way that builds energy. We can actually ditch the scale and allow ourselves to develop our natural beauty instead. May we all experience our own limitless beauty.